Ahead of the supposedly important Serie A big match against Napoli on Monday night, Ac Milan’s January signing, Antonio Cassano try to play down the pressure that have been placed on Milan by stating that the Rossoneri aren’t feeling any tension at all. The Italian international went on saying that despite the danger Napoli and also Inter Milan provides for the red and black squad’s Scudetto challenge this season, Cassano believes that his club are still stronger. “Are we under pressure from Napoli? 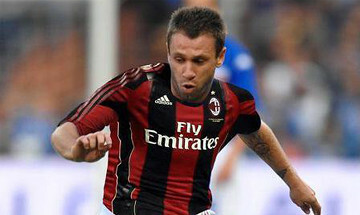 No, here at Milan the only pressure is our blood pressure,” Cassano stated. “I don’t care what Inter and Napoli want. I do not fear anybody. This Milan is not afraid and it shouldn’t be, as it is the strongest team, without doubt. Not trying to be arrogant, Cassano indeed puts out an important statements to cool down the situation before the match which supposedly can ease down any tension that some players might be having considering the importance of the game. Despite already defeating Napoli at San Paolo in the first half of the season, the fact that the Partenopi are only three points away from Milan, should pushed the Rossoneri in looking for nothing but the three points on that game. Being a very important addition in the squad this January, Cassano seemed eager to impress the fans and his teammates as not only cooling down the pressure that the media put on Milan ahead of Napoli’s clash. The Italian international also give a personal motivation for two important Rossoneri forwards, Zlatan Ibrahimovic and also Alexandre Pato, who have been having such a mix conditions lately. Praising his two teammates, Cassano insisted to the media that Ibrahimovic is a player that should not be compared with Napoli’s current flavor of the season, Edinson Cavani, who at the moment has scored more goals in the league than the Swedish. Meanwhile, on Pato, the former Sampdoria striker also motivate the young striker saying that the Brazilian is a great talent that at the moment can only be surpassed by Balon D’Or winner, Leo Messi. Cavani is a good player, but he reminds me of Igor Protti at Bari. He needs to be more consistent. Ibrahimovic is on another level. Pato is the absolute best and I told him that. Only Leo Messi is better,” Cassano said. So far the Italian international has already made an important impact for Milan in the league despite hasn’t really been in the best physical condition due to his two months of absence from football after being frozen by Samdoria by the end on last year. It’s interesting to see whether he can finally get his shape at his best in the next few matches as aside from Napoli, the Rossoneri will soon play against tough sides such as Juventus and Palermo.